In Forza Horizon 3, variety is king. You can drive some of the greatest cars in the history of the automobile or battle-tested behemoths from the distant future and practically everything in-between. Now, with the addition of the Regalia from FINAL FANTASY XV you can experience the one-of-a-kind royal vehicle from the fantastic world of Eos. The Regalia may hail from a fictional world but, as we found out recently, it’s surprisingly grounded in Earthbound inspirations. In the world of Eos, the Regalia is actually an unofficial character in the party and the primary source of transportation for main character Prince Noctis Lucis Caelum and his buddies Ignis, Gladiolus, and Prompto. 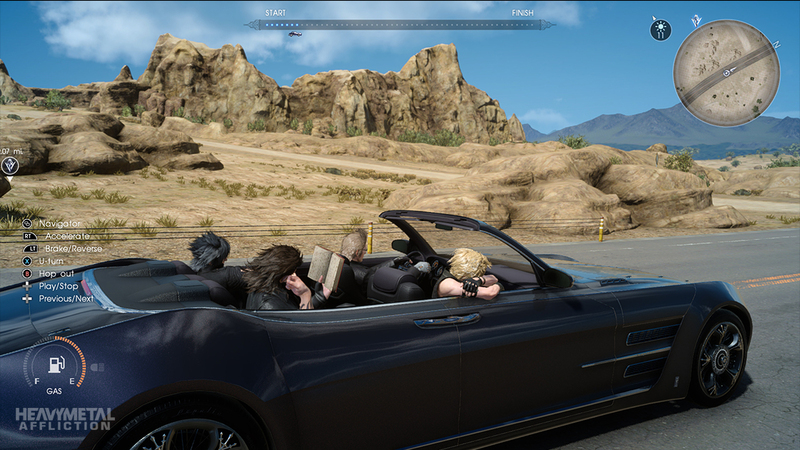 If you haven’t played FINAL FANTASY XV, you do actually drive the Regalia on and off-road, you’re even able to jump it in the open-world setting. Now is your chance to experience the luxurious Regalia in a world built for driving without having to battle beasts or complete quests. For more on how to get your Regalia, check out our announcement story. As with our previous partnerships with Bethesda Studios on the amazing Chryslus Rocket 69 from Fallout 4 and with 343 to bring you Halo’s Warthog, there is a story to tell behind the process of the bringing the Regalia to life. 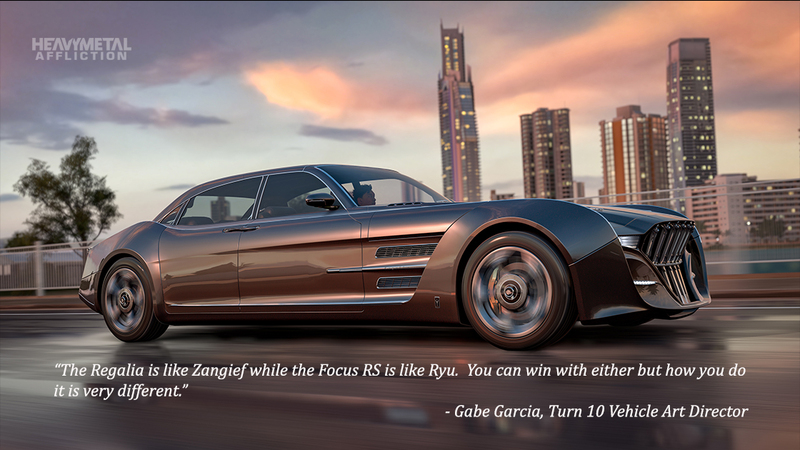 We spoke with Turn 10’s vehicle art director Gabe Garcia to discuss why the Regalia is so unique. 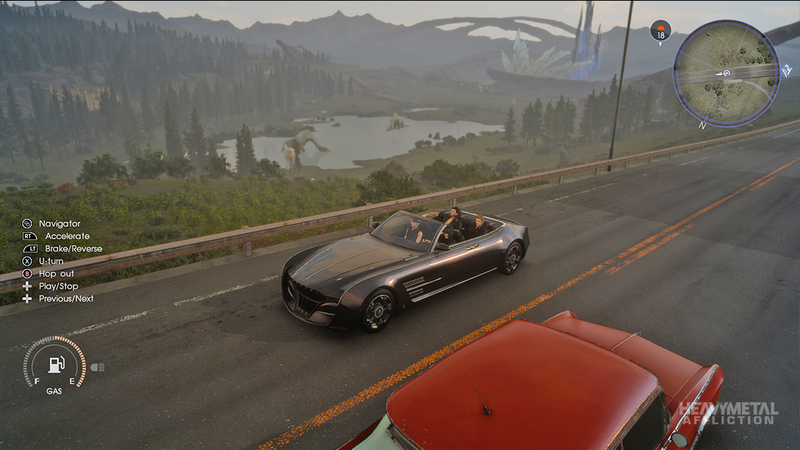 In addition, we also spoke with artist Yusaku Nakaaki and game director Hajime Tabata from Square/Enix to better understand the cars origins in both the real world and the world of Eos in FINAL FANTASY XV. “Fantasy cars are designed to tell the story of their particular worlds, be it conquering alien wastelands or everyday life in a world of future past,” Garcia said. “These vehicles are not beholden to governmental standards of real-world cars.” And because Turn 10 artists can’t physically touch this car or refer to real-world performance data, this presents a unique challenge. This is where building a fantasy car can be more fun that a regular road going car. “We put extra time into reconciling everything,” Garcia said, “from the visual to the audio to the physics data to allow the car to perform in accordance with what its appearance would indicate.” For reference, Square/Enix provided solid data and images but from there it is up to the judgement of Garcia and his team to determine performance parameters and how that translates to in-game physics. According to Turn 10 senior franchise manager William Chen, more than 1,500 work hours went into the creation of the Regalia and this special collaboration with Square/Enix. From initial idea to the dozens of artists across three countries that were involved, it takes a team of dedicated experts to build a car for a Forza game. The overall goal? “It’s all about immersing the player in their respective universes,” Garcia said. Every car is limited by a polygon budget, which creates a visual standard within each game for how many visual building blocks a car can utilize to be represented. With its intricate details and luxurious stylings, the Regalia is so ornate that its details pushed those budgets. 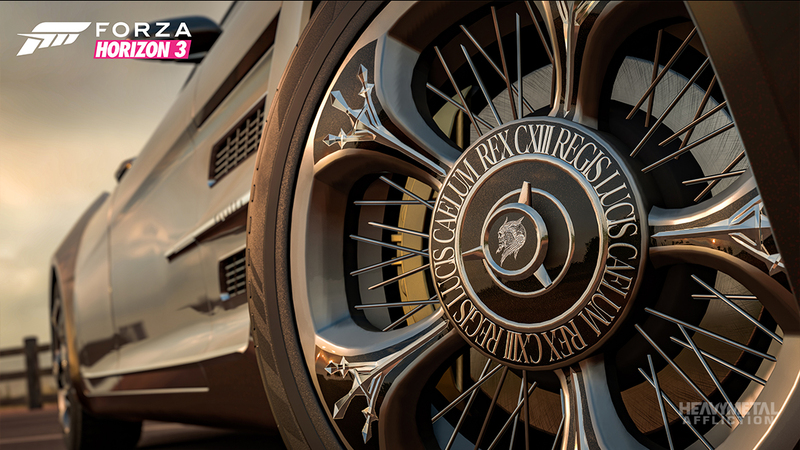 From the Chocobo talons and monograms on the polished wheels to the convertible roof that articulates similar to that of the Ferrari California, all the way to the doors, which slide out and swing open “suicide” style, the Regalia is full of special features. 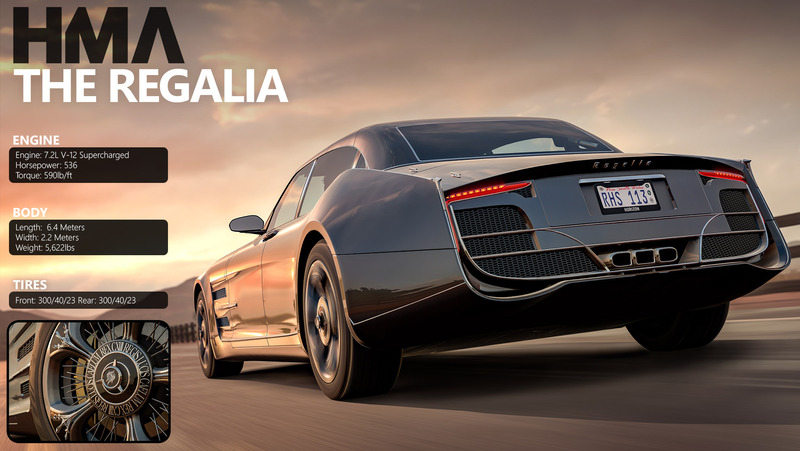 Style is one thing but, for many, what counts is under the hood and the car’s 7.2-liter supercharged V12 with its 500+ horsepower make the Regalia only lacking in one thing: disappointment. After all, this is a car built for a king. Creating a vehicle to drive on a road-trip themed fantasy journey is a far cry from riding a Chocobo or even piloting an airship to quickly navigate a huge world infested with beasts that are doing their best to defeat you. What inspired Square’s concept of the Regalia? Inspiration for the road-trip theme brings the two studios even closer. 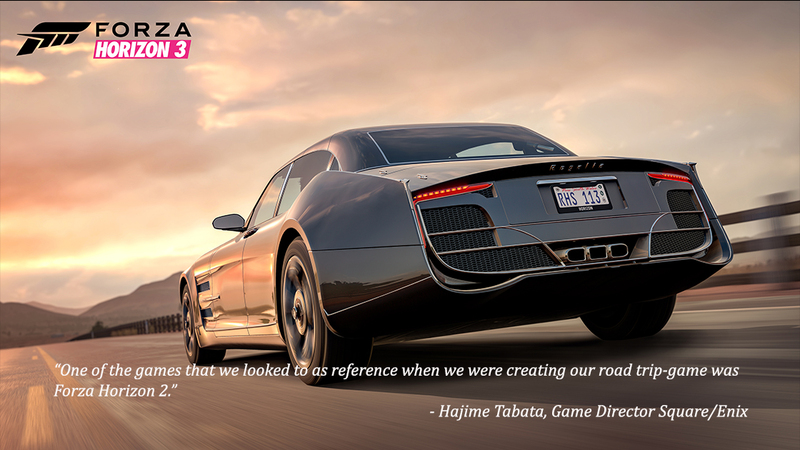 “Our ties with Forza run deeper,” Tabata said. “The reason being, one of the games that we looked to as reference when we were creating our road trip-game was Forza Horizon 2. That’s why this collaboration is quite unbelievable and a real honor for us.” Plus, according to Tabata, Square/Enix is full of car lovers; including employees who run track days in their off time or even store engines in their living room for future restoration projects. One of the biggest challenges was incorporating the experience of traveling with your buddies, something that has now become a highlight of FINAL FANTASY XV. The Final Fantasy series is far from a driving game, it is an epic role-playing adventure. So the focus of the Regalia according to Tabata was to create a fun traveling experience as a passenger rather than the actual driving itself. In the game, the technology and the common cars of Eos resemble that of the 1960s. The Regalia is an obvious exception, built in the country of Insomnia which has magical resources and utilizes much more modern technology. This explains the dramatic contrast of its design to the rest of the cars of the world. All cars of Eos run on gasoline though, and you can fill the tank of the Regalia for just 10 Gil.